There's more to a guided fishing trip with Jeff Sundin than just setting out to catch a limit of fish. No, with Jeff, it's a lot more like getting your own personal, on-the-water fishing seminar. You will learn some of the closely guarded, inside secrets of the pro's. Details about the seasonal movements of fish, the selection and use of the right tackle for the job, tips on boat control and hands-on, use of the latest in electronic equipment, rods and reels and gear that will help you understand the world of fishing. You're bound to learn something that will make your own fishing more productive and fun forever! Northern Minnesota's 1000 Lakes Area is the perfect destination for your next fishing vacation. It's a multi-tasker's dream come true! Located in Grand Rapids Minnesota, "The Service Area" is large and includes many of the North Central Minnesota's most reliable Lakes. 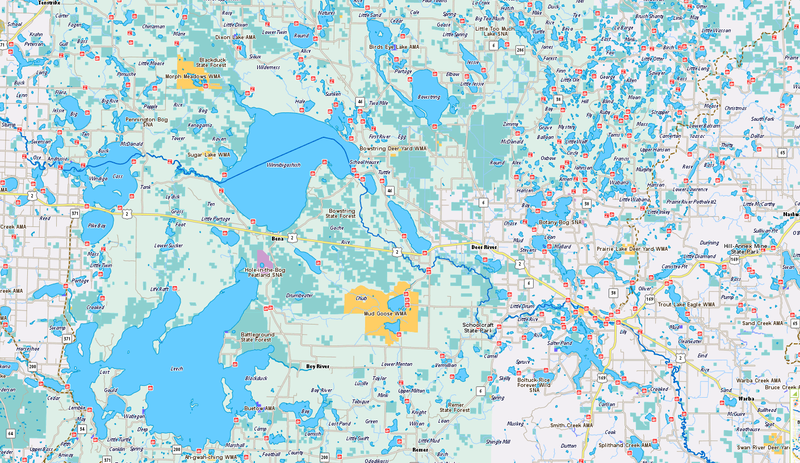 I refer to it as the Itasca Region and we typically fish within a 75 mile radius of Grand Rapids. Enlarge the map for a better look at most of the regular service area. Typically, transportation to and from the best fishing lakes is provided, but arrangements for special meeting places and times can be made in advance to accomodate any special requirements. We can Walleye fish, go for Crappie, catch Perch, Northern Pike, Bass, panfish and even Musky!. Book your next guided fishing trip with me and see what great customer service is all about." By the way, "We Have Gift Certificates Too". Some of the more popular lakes include; Winnibigoshish (Big Winnie), Cutfoot Sioux, Leech Lake, Red Lake, Cass Lake, Pokegama, Deer Lake, Bass Lake, Moose Lake, Bowstring, Round, Sand, Jessie and Big Trout. 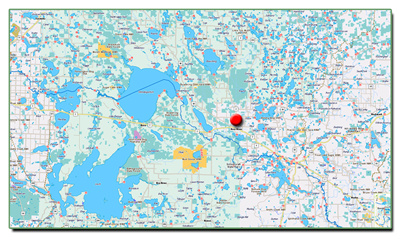 In addition to these great lakes, there are hundreds more within the Itasca Region and depending on what we're fishing for, we could wind up on most any of them. Planning a fishing trip that serves YOUR needs will depend on seasonal migrations of fish, weather conditions and your own availability of family vacation time. *Additional people may be accomodated in a variety of ways. Additional Guides, Follow Boats and Split Day Trips are all available. We want you to have a fantastic trip and we'll work with you, so if you have special needs, Please Ask! Reservations are on first come, first served basis. For best dates, please book early. Deposit of $100.00 per trip is required to guarantee reservations. Deposits are non-refundable EXCEPT when cancelled by the fishing guide(s) in the interest of safety or under extenuating circumstances, agreed to in advance. Fishing is an outdoor sport and in Minnesota, it rains, snows, blows and gets hot. Except when it poses a threat to safety, weather related cancellations are extremely rare. If you do not like fishing in inclement weather, talk to me before you book your trip to explore options. Customer cancelled trip(s), if successfully re-booked, may qualify for deposit(s) to be carried over to secure an alternate fishing date. Re-booking is subject to availability and may not always be an option. Please contact us as soon as possible for the availability of alternative dates. Wouldn't you just love to get a gift like this yourself? A full service guided fishing trip in Northern Minnesota on some of the best fishing lakes that the midwest has to offer. Some of your favorite people would love the gift of a guided fishing trip too! Gift Certificates are a great way to treat your friends and family to the fishing experience they've always wanted. Gift certificates are valid for three years, so there's plenty of time to get a date that you really want. Just select your trip and payment options and we'll mail the certificate. Your own current Minnesota Fishing License. Layered clothing appropriate for Minnesota's changing weather. Rain gear suitable for the season, Totes or other “slip on” rain boots to protect your feet are highly suggested. Cooler with plenty of ice, soft drinks, water and snacks. Alcohol is allowed; please use it responsibly. Take Your Kids Fishing! We encourage family trips. This is a great way to get your kids interested in the world of fishing and they'll appreciate spending some great quality time with you. When we're fishing with your kids though, it's vital that the trip be geared to their abilities and interests. Please let us tailor the trip to satisfy them, they'll be eager to do it again as long as we keep it fun. You deserve the best! A safe comfortable trip, with the best chance of success possible. That's what we're after. That's why I operate the best equipment available. My fishing rig is a dependable 20 foot Lund 208 Pro V, Mecury Verado Engine and Shorelandr' Trailer. There's Plenty of space for everyone and all of their gear and this ideal fishing boat provides a comfortable, dry ride with seating for up to three passengers. The boat is equipped with the most up to date Humminbird sonar and GPS available. To assure the best chance of success, all tackle and live bait is provided at no additional cost. All top of the line fishing rods are provided as needed too. After all, you're supposed to be free to enjoy your trip. Not wasting time running around searching for some exotic bait or that one secret lure that you can't be without. We'll provide it for you! After the trip, your fish are cleaned while you relax. Shore Lunch is available on full day trips. Never had one before? You don't know what you're missing. A few fillets, some fried potatoes & beans. You'll be looking for second helpings. You may want to bring along some adult beverages. Please keep in mind the spirit of our outing, use alcohol in moderation please. Custom Services and Large Group Services Available. Want something special? If you've got an idea, we can help. In association with a group of Northern Minnesotas Top Fishing Guides. There are no requests too big to handle! Together, we can accommodate large groups such as family reunions, employee incentive programs and customer appreciation outings. We can even offer combination fishing & hunting trips. We can provide information on lodging and recommend other attractions in the area to visit while you're here. We are devoted to providing you with a quality trip that you'll remember forever. Planning ahead is essential for large groups. Dates fill up early. Our network of Professional Fishing Guides is an association of top quality guides who work together, allowing us to provide you with a consistently high level of service. As a group, we represent hundreds of years of guiding and fishing experience. We can provide service to large groups, help with hosting special events and providing promotional services to companies in the fishing, hunting, shooting and other outdoor sports related industries. We realize that the future of our sport depends on the prudent management and selective harvesting of the resource. We encourage selective harvest of fish and game and highly recommend voluntarily limiting the catch to help ensure quality fishing opportunities long into the future. Follow my credo; "Don't talk about sportsmanship, practice it'. Alll we have to do is give a little bit and we'll enjoy great fishing for many years to come. Do you need some help finding the perfect match for your lodging needs? You're in luck because over the years, we've gotten to know a lot of folks in the lodging industry. We can definitely help you find the perfect resort, lodge or motel that best suits your needs. You can check some of them out right here on our recommended links Page. But if you'd like more details on planning your trip, let us know what you need and we're happy to help with suggestions. "I Want To Be Your Fishing Guide!" Biographical Information; Professional angler Jeff Sundin knows the fishing waters of Northern Minnesota inside and out. Serving Grand Rapids and the greater Itasca region for 30 years as a full time guide, Sundin hosts fishing clients from all over the country. Clients spend their day fishing on one or more of the dozens of lakes in his repertoire. Truly a multiple-species fisherman, Sundin serves his customers healthy doses of sage advice about how to catch fish both big and small. 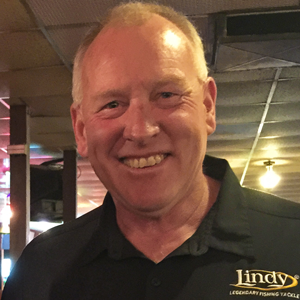 Sundin loves to host fishing trips for Crappie, Northern Pike, Smallmouth, Largemouth Bass, Musky and more, but his specialty is Walleye fishing and he’s provided literally thousands of anglers with their “first of, most of and largest of” Walleye fishing experiences. “Sundin is a walking textbook of tips and techniques for catching fish” said longtime fishing customer Carl Bergquist who’s fished all over the country and rates Sundin high on the list of top guides to be found anywhere. Living and breathing fishing, Sundin hasn’t rested at being the areas foremost fishing guide. His time on the water has helped him develop talents that serve the world of sport fishing in many ways. His daily written fishing reports deliver up to date information about seasonal fishing trends, tackle selection and fishing techniques within the territory. Anecdotes from the lake along with facts about area waters make the reports fun to read and he’s developed a large following; hundreds of thousands or pages are viewed on his website every year. Sundin co-hosts a weekly radio program that’s spanned almost as long as his fishing career. “The Early Bird Fishing Guide” is equally comfortable going on the air to field questions about the search for fish. An accomplished photographer, guest speaker and outdoor writer; sundin continues to gain momentum as a promotional fisherman as well. Equally comfortable working on either side of the camera; “his ability to Multi-Task has become one of his strongest working assets” says world renowned promotional/tournament angler Marty Glorvigen. 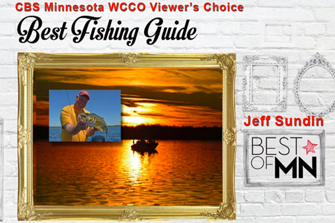 In May 2018, Jeff Sundin was honored by winning the CBS Minnesota, WCCO Viewer’s choice award for Minnesota’s Best Fishing Guide. “I’m especially appreciative of this award because it was derived from a public vote that included anglers and fishing fans from all walks of life. Unlike many fishing awards that are randomly presented by insiders; members of the good old boys club, this one comes straight from the votes of ordinary people who simply love fishing”; Sundin says. After 33 years, the veteran fishing guide sees no reason to slow down either. Sundin says; “With 30 years of learning behind me, I can spend the next 30 will be a lot easier and we’ll be having more fun than ever”.